When it comes to caravanning and camping, Victoria has some of the best caravan and tourist parks in the country. Whether you're a wild bush camper or a comfort-seeking glamper, Victoria's national parks, rivers, reserves and charming country or coastal towns have sites and attractions to suit every style. There is an abundance of affordable accommodation options with top-ranked facilities, set amongst scenic locations and close to major tourist attractions. 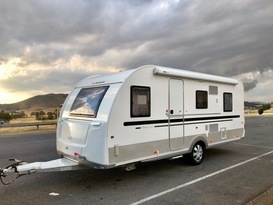 Caravanning is so popular in Victoria because with a caravan or camping site around every corner, there is no better way to experience every adventure this marvellous state has to offer than by road. From the central beating heart of Melbourne, up through the Yarra Valley,across to Ballarat and the goldfields, or Geelong and the Bellarine, you can indulge in the award winning local restaurants, cafes, wineries and breweries that Victorians are famous for.Stretch your legs in the Dandenongs, the Grampians or the Macedon Ranges, or simply relax and enjoy a spa retreat with hot springs in Daylesford. Camp right on the Murray, chase snow in the High Country or explore the charming townships of Gippsland. If you prefer the beach, stay overnight at Phillip Island, take the Nepean Highway down the Mornington Peninsula or go the other way and experience the delights of the Great Ocean Road. Wherever the road takes you, Victoria has powered and unpowered caravan and camping sites just about anywhere you choose to park.If you don’t have a caravan, camper trailer or motorhome simply browse Camplify's listings for your perfect RV. Here's some of our featured vans for Victoria. We have many more! Head over to our Search page to find the perfect caravan or motorhome for your holiday.